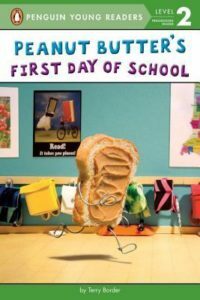 Peanut Butter (a slice of bread with peanut butter spread on one side and metal twisted into arms and legs) is new in town and has made a few friends but is still really nervous about what he needs to do on the first day of school. He asks each of his new friends but they don’t know how to help him. The big day comes and each of his friends help Peanut Butter throughout the day so he ends up having a great first day and makes even more new friends. Fun easy reader (level 2) for young kids who may feel apprehension about the first day of school.